Last year, I invested some time finding gifts for almost every member of my extended family that included a book and a movie. I used quite a few resources online and offline and was able to come up with some great (at least I hope they were great) movie and book pairings customized to the interests of each one of the recipients. This year, I am determined to help make a similar search easier for both myself and for you by creating a resource aimed at recommending great book and movie pairings. I hope I'll be able to find something for everyone on our gift giving lists from Grandma right down to the new toddler in the family and that, by the time the holidays roll around, we will both have a plan in hand for each and every one of the people on our gift-giving lists. I started this week with Marley and Me. This book and movie combination would definitely suit any dog lovers on your list, adult dog lovers, that is as well as anyone who loves a funny story. Personally, I enjoyed the book and I loved the movie. You should be aware that, contrary to popular belief, the book Marley and Me was written for an adult audience and NOT for children. Fortunately, however, the author went back to the drawing board (or his computer) and created a series of Marley and Me books for children and, as well, he created a version of the novel that is more suited for younger readers. 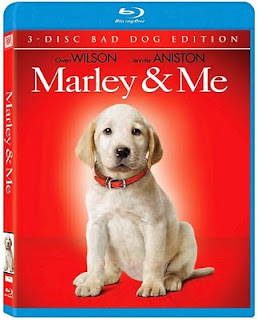 Rated PG, the Marley and Me movie is suitable for children of middle-school age. Be aware that the story in the book and the movie touches on issues related to sexuality and pregnancy and features some sad situations. You can read more about this gift recommendation on the first page dedicated to our new adventure, A Book and A Movie: Marley and Me Gift Set. I hope you will return to see what other book and movie combinations I come up with. Buy the Marley and Me book and movie on Amazon. Marley and Me made me tear up so horridly. It reminds me of my cat and myself. We have a true understanding of each other and I can't imagine losing her but she is getting old. Thanks for stopping by! I was going to tell you, so you feel better about not seeing Avatar in 3D at home, 3D really isnt good for you. It's okay once in a while but not something I would recommend for an at-home theatre. Basically it is splitting your vision, imagine how confused your brain is lol. What a cool thing to do! I saw Marley and Me in the theaters and people were sobbing (I was definitely tearing up). It's so touching yet heart wrenching. Overall, it's a very good story.